Few genres come burdened with a heavier air of self-importance than the biopic. For they are expected to not only tell an entertaining story, but also serve as a compelling tribute to their famed subjects’ profound importance and exceptionalness. Muddying the waters further is the fact that, frankly, reality isn’t cinematic; serious artistic license and dramatic flourish is required in order to transform it into anything approaching an engrossing viewing experience. Filmmakers have to walk a tricky balancing act, dishing out equal parts invention and accuracy. And the majority fall well short of brilliance. Great entries like Raging Bull, Ed Wood, The Social Network, Malcolm X or The Coal Miner’s Daughter succeed because their protagonist's personal account arrives tightly wrapped in a richly layered narrative that cleverly tackles universally relatable themes. It’s not enough to simply tell us a person is significant. We need to be able to connect emotionally with them and derive meaning from their unique journey. 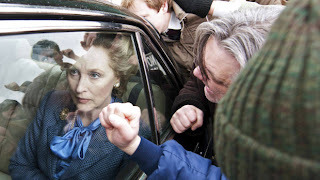 Alas, The Iron Lady, the new Meryl Streep-fronted examination of the life and times of Britain’s controversial first female Prime Minister, Margaret Thatcher, couldn’t be any less vital. A cobweb-riddled grab-bag of musty old biopic clichés, archival footage and shallow historical bullet points, the picture falls prey to the same brand of lazy, trite screenwriting and overbearing stuffiness that hobbled Clint Eastwood’s dreary J. Edgar. It’s as if the filmmakers, fearful that audiences wouldn’t grasp or respect the magnitude of Thatcher’s achievements alone, decided to overcompensate by dressing up their effort in clumsy TV-movie obviousness and forced sentiment. It’s been a while since a biopic championed its own cause harder than this one. 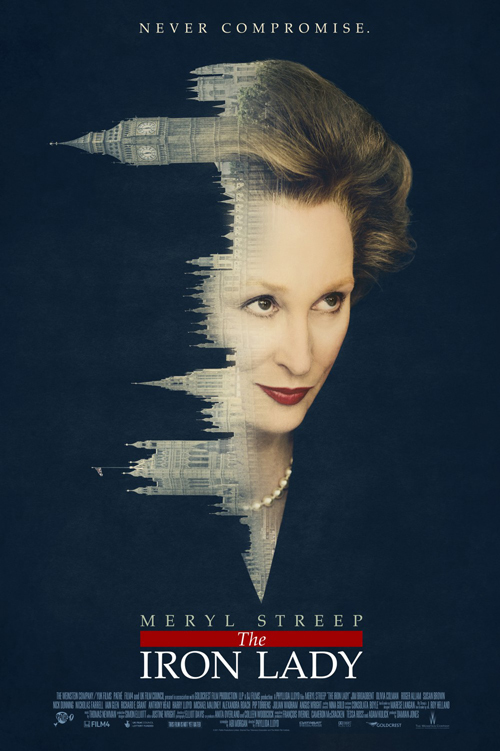 Set largely in the modern day, The Iron Lady presents Thatcher (Streep) as a stately, good-humoured senior citizen, whose grip on sanity is being tested by frequent hallucinations of her deceased husband Denis (Jim Broadbent, twinkling with mischievous wit). Still grieving his loss, and unable to bear moving his belongings from her bedroom closet, she finds comfort by escaping into the past, recalling key personal milestones involving their courtship, her working class youth (in which she’s played ably by Alexandra Roach) and early forays into politics, first as an Oxford student, and later as a Conservative M.P. and education secretary. As well, we witness her miraculous rise to power, and her unprecedented 11-year reign as Britain’s leader, tackling fiery issues such as the 1981 Brixton riots, the 1984 miner’s strike and – most interestingly - the Falkland Islands military conflict. Unlike similar, superior fare such The King’s Speech or The Queen – which used a single captivating event to explore their main character – the film spreads itself way too thin by trying to cover so much terrain. 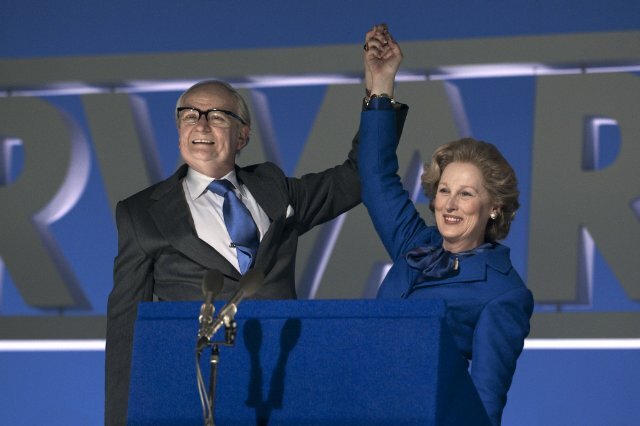 At just 105 (thankfully well-paced) minutes, The Iron Lady’s script, by Abi Morgan, hops, skips and jumps hastily through Thatcher’s lifetime without ever pausing to delve deeper into any of the crucial events. Did no one realize viewers might actually be intrigued to learn why exactly this woman was able to excel as she did? Or see how her role as a wife and mother affected her role as a leader and vice versa? This final product is like Coles Notes cinema, communicating only the barest of details without any of the desired context, curiosity or dynamism. The picture’s creaky structure does it no favours. Can we please call for a moratorium on biopics that feature actors in old-age make-up using faded photographs, videotapes and brief memory snippets to recollect their lives in nearly precise chronological order? It’s a beyond-exhausted story device that reeks of artificiality. The Iron Lady relies on this conceit so heavily, it’s kind of amazing. The lion’s share of the movie’s attempts at poignancy and truth are stuffed into hokey, bewildering sequences of Thatcher being pestered by Denis’s ghost (who often wears funny hats!) and devolving into bouts of pitiful hysteria. And since her career spanned such a lengthy period of time, and ended so mundanely, there’s no grand, moving final note to close on. So the film just sort of peters out with a series of concocted fictional moments in which she confronts her demons and achieves blissful serenity. Under the direction of Phyllida Lloyd – who previously guided Streep in 2008’s Mamma Mia! – these scenes play more like parody than honesty. 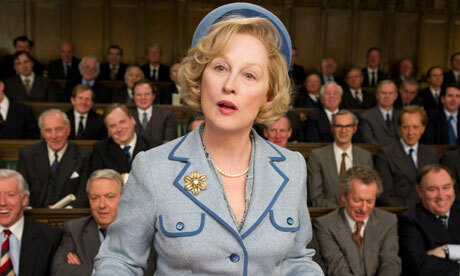 It goes without saying that Streep is, as per usual, a mesmerizing force of nature on-screen. She doesn’t imitate Thatcher. She inhabits Thatcher. And her performance is so dead-on smart, funny and authoritative that she almost single-handedly redeems the whole uneven affair. Portraying the character over four decades, the legendary actress is completely convincing every step of the way, and brings more dimension to the role than anything offered by the page. In one of her many crackerjack bits, she verbally demolishes a long-time colleague for being unprepared for a meeting, and we sense both her innate anger and stubbornness, and, conversely, her sad regret at having to behave so harshly. 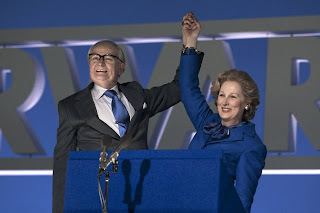 Streep also forms a warm union with Broadbent (who, unfortunately, is relegated mainly to popping up in the fantasy sequences). It’s too bad the film doesn’t spend more time with them in the countless flashbacks. If only this movie wasn’t so timid and unwilling to think outside of it’s safe, unchallenging prestige picture box. With Streep giving it her all, this could – and should - have been an exciting, absorbing portrait of one of the 20th century’s most complex and contentious figures. Agree with her politics or not, Thatcher was a woman of tireless drive, fierce intelligence and vision. She deserved a movie far better than The Iron Lady, which fails on all three of those counts.